Part of Cardo Road near its intersection with Galley Road was washed out by flooding Wednesday, June 17. More flooding photos can be seen on the SDN website and Facebook page. Josh Cox, left to right, takes his daughters Gail Cox, 4, and Lynn Cox, 4, all of Port Jefferson, for a canoe ride throught their flooded backyard Wednesday, June 17. The girls are also the children of Krystal Cox. A section of Sharp Road near County Road 25A is under water around 10:10 a.m. Wednesday, June 17. A truck and pick-up pass each other around 10:10 a.m. in front of 10350 County Road 25A where flood waters are washing over the road Wednesday, June 17. Many farm fields in the area had substantial flooding. Flood water lap the edges of a barn on County Road 25A Wednesday, June 17. SIDNEY — A flash-flood warning was issued by the National Weather Service for most of Shelby County early Wednesday morning, lasting through the evening. In Sidney, the city’s Flood Action Plan was initiated at noon Wednesday as the level of the Great Miami River had reached 10.5 feet. The city staff was monitoring the rainfall closely as the river was rising 10 inches an hour after the most recent rainfall, city officials said. At noon, the river had not crested. City departments will continue to monitor the situation, officials said. A copy of the Flood Action Plan, along with the latest river level, is available on the city of Sidney’s website, www.sidneyoh.com. The data on the river monitoring station on North Street show that from midnight to 6 a.m. Wednesday, the river level was slightly below 5 feet. The level began to rise after that, hitting 6 feet at 6 a.m. Then, there was a sharp rise to 10.74 feet by 12:30 p.m. The city of Sidney’s River Flood Action Plan describes river levels of 11.1 to 12.1 feet as “minor flooding.” “Moderate flooding” begins at 14.6 feet; “major flooding” at 18.02 feet; and “record flooding” at 18.54 feet. In the last 24 hours, Shelby County has received about 8.27 inches of rain total from different places around the county reporting to the National Weather Service. It has rained some amount everyday in Shelby County since June 11. Shelby County Engineer Robert Geuy said most of the flooding and high water is north of Ohio 47. It’s mostly minor localized flooding caused by culverts getting plugged up with debris. He said his crews are out working to unplug those so the water can drain off the roads. He had a list of 20 different roads that have been closed due to high water as of around noon Wednesday. He said this number may increase if the rain continues. The chance of rain will be 22 percent at 7 a.m. Thursday, then it will increase again to a 51 percent chance Thursday afternoon, according to the National Weather Service. Another 2 inches of rain is expected in some areas Wednesday night. Rain is supposed to continue off and on through Sunday. • Ohio 47, west of Newport. • Ohio 29, between Mason Road and Ohio 705. • Ohio 274 at County Road 25A. • Ohio 47 east of the cemetery, between Port Jefferson and Port Haven. • Ohio 65 at Baker Road. The 5000 block of Cardo Road was completely washed out. Construction on Interstate 75 has been slowed down because of the rain, but nothing has been interrupted due to flooding, according to officials. The Sidney-Shelby County YMCA closed Wednesday, reportedly because of high-water-related problems. A notice on the Y’s website Wednesday afternoon said the facility was closed through the evening and all classes are canceled. “Given the current circumstances, we are anticipating opening at 5 a.m. tomorrow morning and resuming all services. To be on the safe side, please call in advance to verify that the Y is open. We apologize for the inconvenience and appreciate your patience and understanding,” the notice said. The Village of Anna posted on their Facebook page at about 11 a.m. Wednesday that they were doing everything they could with the sewer systems. They asked citizens to please be patient as the creek is the only outlet for the town. Storm sewers are full and the sanitary sewer is taking on heavy water as well. They asked residents to please use caution when flushing toilets, washing hands, and showering as water may back up. New Knoxville Village Administrator Rex Katterheinrich said Wednesday morning they’ve been very fortunate. They have nothing closed so far and both branches of the St. Marys River have stayed in their banks. Minster Village Administrator Donald Harrod said Wednesday morning there are a couple spots under water. He said the canal is reaching its bank top and getting into some yards. The village administrator of Botkins, Ryan Piche, said they are at a higher elevation than most of the county, so they have been spared for the most part. There is a sign up because of some water flowing across Lynn Street, but Piche said it’s easy to navigate around. 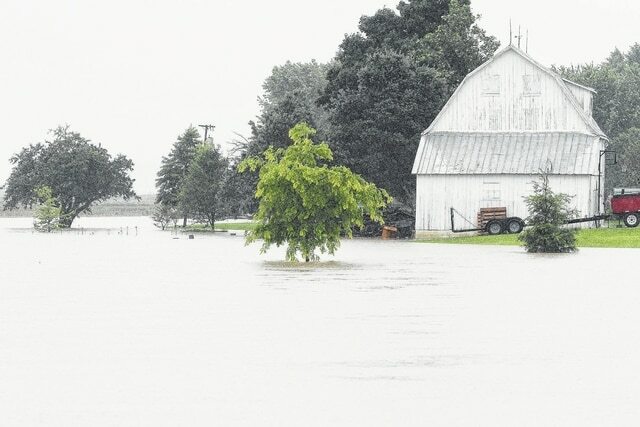 Wayne York, village administrator for New Bremen said their official rain gauge reported 3 inches of rain between 3 a.m. and noon Wednesday. He said the canal started overflowing around 9 a.m. near Plum Street, but this is common for any rainfall over 2 inches. York reported several other incidents of flooding around New Bremen including an unusual amount of water in Westy’s Signature Flooring. He said the closest flooding incident to this happened in February 2011. Talk of events being cancelled around the county in the upcoming days is prevelant on social media. Here is notice of one event being canceled. We will keep you updated of any more. • A Hog Roast at LanePark of Sidney, 1150 W. Russell Road, scheduled for Thursday evening has been postponed, due to the impending high water problems plaguing Shelby County. A new date and time will be announced. Auglaize and Allen counties have experienced extreme flooding and high water as well, their flood warnings lasting much longer. A state of emergency was declared in Mercer County Wednesday afternoon because of the amount of flooding. The declaration means the county can exercise emergency authority to protect lives and property of county residents.